Around three hundred tunnels that were used to smuggle goods and arms from Egypt across the border to the Gaza Strip are no longer in operation, according to a report issued by a UN body. "As of 21 September, only an estimated ten tunnels were believed to be operating, down from approximately 300 prior to June," stated the report by the UN Office for the Coordination of Humanitarian Affairs (OCHA), which was published last week. The Gaza Strip heavily relies on the underground tunnel network through which commercial goods such as fuel and basic construction materials are smuggled to bypass an Israeli blockade of the impoverished enclave and Egyptian-imposed border restrictions. Egypt moved to crack down on the tunnels after an attack by militants killed 16 Egyptian soldiers in the Sinai Peninsula in August 2012. The operation has gathered pace since the Islamist president Mohamed Morsi was ousted in July by the military after mass protests against his rule. Egypt, which is carrying out large scale military operations against Islamic militants in Sinai, has recently accused Hamas, an ideological off-shoot of the Muslim Brotherhood, of interfering in its internal affairs to support Morsi and the Brotherhood. Hamas has denied these accusations. Since 3 July, Egypt has intermittently closed its Rafah crossing, the main gateway to the outside world for the 1.7 million Palestinians in the Gaza Strip, citing security concerns. The operating hours of the border on the days when it is opened have been limited to four hours per day, six days per week – down from nine hours a day, seven days per week, according to the report. Only authorised travellers – including foreign nationals, visa holders and patients - are allowed to cross the border, leaving hundreds of other Gazans stranded on both sides. Palestinian students wishing to study in Egypt or abroad have also been unable to reach colleges. Meanwhile, ordinary Palestinians, many of whom are reliant on UN aid, have seen prices for basic commodities shoot up. The report also revealed that the Gaza power plant has been forced to reduce electricity production and is in peril of completely shutting down due to shortages in fuel coming from Egypt, which is far cheaper than that purchased from Israel. A drastic slump in the smuggling of construction materials, which made up 80 percent of Gaza's growth during the first quarter in 2013, is largely endangering growth in the enclave. "The resulting shortage has triggered sharp increases in the prices of building materials; the price of cement has more than doubled." The diminishing fuel stocks have also endangered approximately 290 water, sanitation and hygiene facilities. 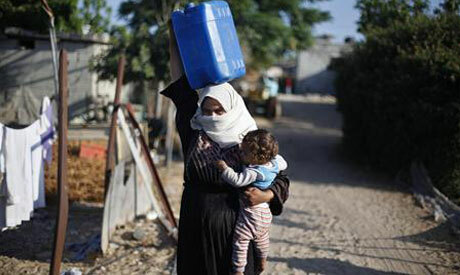 "An estimated 600,000 people within the Gaza Strip may not have access to adequate and safe water and sanitation services as a result of increased power outages and lack of fuel," stated the report. The health sector has also been hit hard by severe restrictions Egypt has imposed on the border crossing and by the demolition of the tunnels. According to the UN report: "thirty percent of essential medicines and 51 percent of medical disposables are at zero stock in the Gaza health ministry's Central Drug Store." Shortfalls in fuel and building materials have led " thousands of workers in the construction, transport, fishing and agriculture sectors, as well as in tunnel smuggling, to lose all or part of their income." Recent actions by Egyptian authorities to counter illegal activities and combat militant insurgency in the Sinai, have crippled fishing activity off the coast of Northern Sinai, the report argued. "Fishermen from Rafah have since reported that it has been very difficult to access Egyptian waters as they were accustomed to, and fishermen are frequently warned by the Egyptian navy through loudspeakers to vacate the area." Egyptian naval police shot and wounded two Palestinian fishermen off the Gaza Strip last month. Five other fishermen were arrested for illegally crossing into Egyptian territorial waters and sentenced to a year in prison by a military court.